Do you have more than 1000 characters in Last Product(s) and Last Categories Bought properties checkbox field type? Recently Hubspot has changed the option limit for all dropdown deal properties from 5000 down to 1000. Revenue Conduit is receiving error 'Property value were not valid' while syncing for customers whom have more than 1000 properties for any multi select checkbox fields. Revenue Conduit will be reformatting all the fields mentioned above as a single line text fields instead of multi pick checkboxes. 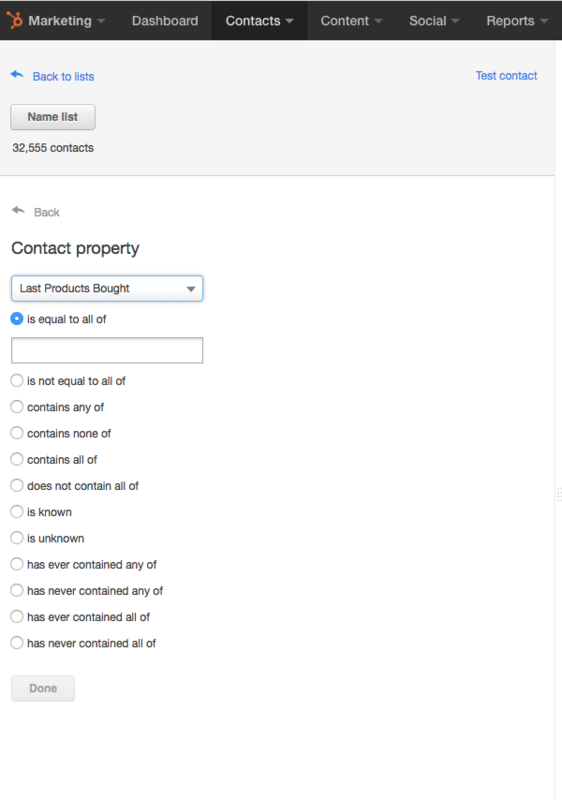 This feature is not going to work for you in the Deal Records for awhile until we have rebuilt this functionality if you have over 1000 options per property type however, you can utilize those properties for the contact record instead of the deal record in any smartlists or automations. 6. Choose the filter you want to use for your list (ie if you want to see anyone who has a known value than you can simply select if the Last Products Bought is known). 7. Name and Save your Smartlist so that you can view and use the list in the meantime.